Maestronet Admin's Blog Tim McTigue's Blog moellis' Blog jaclynatkinson's Blog Rita's Place, Rebecca Rose's Blog hrobert's Blog Laughing Prince's Blog Sergeij Rahkmaninov's Blog viola_license_revoked's Blog Mountain Luthier's Blog Making a Violin Glenn Hunt's Blog gouger's Blog codeprost's Blog The Ways of the World JDGillespie's Blog ronwalker49's Blog ronwalker49's Blog Sandra012341's Blog catmccall's Blog madog's Blog madog's Blog James M. Jones' Blog pradaerloves' Blog Cristina9's Blog fiddlesurgeon's Blog Misical Passages' Italian House Blog Misical Passages' Italian House Blog Bill C's Blog jstainer91's Blog ramanaji's Blog ramanaji's Blog injection-mould's Blog artmusic's Blog artmusic's Blog vin3335412's Blog num1guitar's Blog TheSouthernTraders' Blog TheSouthernTraders' Blog aldric no 71 1835's Blog aldric no 71 1835's Blog ani's Blog ani's Blog aprilchill's Blog jiajiale's Blog cabrinee's Blog instrumentos music. finos' Blog instrumentos music. finos' Blog hujh's Blog leelilyaaa's Blog Finsternis' Blog Finsternis' Blog futangdg's Blog Torbjörn Zethelius hcg's Blog zzzxx's Blog zzzxx's Blog maya black's Blog jamesng886's Blog xiaowei11's Blog Aelspet's Blog majian's Blog wowo001's Blog wowo001's Blog omoni's Blog omoni's Blog eynfcred's Blog teng2012001's Blog mhfais' Blog mhfais' Blog fufu's Blog G DGDFG's Blog callmehello's Blog wer12's Blog wowgold's Blog lixiang's Blog lixiang's Blog jiposdoas' Blog pingpang's Blog Gary411's Blog lixiang's Blog wangwenwen's Blog pkteragold's Blog lixiang's Blog Donna Flynn's Blog Donna Flynn's Blog Konenfant's Blog rockybaroque's Blog beulah123a's Blog wedding dress' Blog suny's Blog eynfcred's Blog xushiyang891114's Blog xushiyang891114's Blog icheapbelts injection-mould's Blog lorakunneva's Blog Matthew Gryspeerdt's Blog Matthew Gryspeerdt's Blog Background of Weighing Machines Important Concerns For Choosing an Evaluating Balance Logical Weighing Programs in the Laboratory Weight Cells And Their Uses Analyzing Weighing machine Strategies For Choosing Commercial Weighing Machines c.m.sunday's Blog my blog Collin Bank: A premium bank offering excellent personal banking services Leluda's Blog alisa's Blog lebron10's Blog Lebron10lasay9ya's Blog nikefree3lay's Blog nikefree3mensbo's Blog airmax90yes' Blog nikefree4hao's Blog annawilliam's Blog Life is Music - Play it Well! I wanted to start this topic with the hopes that it would become a useful resource for those who are looking to go in a particular direction with wood and ground coloration and are unsure of a place to start. Of particular interest to me is producing a wood color that leans on tan with grey hints. Not much yellow, and very little green. But, it would be nice to see everything that’s out there. If you have examples of any process you’d like to share, even if you didn’t like the result, it would be wonderful to have here in one place. I ran out of my top coat spirit varnish. My formulas are in a notebook that must be in storage. Hazards of a tiny workshop. I know it had benzoin, mastic, lac blah blah, just don't remember. Got a good formula that will bond well to oil and go on nicely? Thanks much. Any Cremonese Basis for Colored Rosinates? Michelman pp 31-43 argues for a historical basis to rosinates extending back to Cremonese times. I think his arguments are weak. I have also looked for modern analyses that could resolve this issue and found none. Maybe I overlooked someone's research. Does anyone have a better argument for rosinates used by Cremonese makers of Stradivari's time? So, ....is it bad if your brand new varnish develops a 100-years-old-like crackle effect within a month of being applied? I found this on the web, awesome images, finally the proof that Stradivari was extraterrestrial.... Joking aside, the varnish looks very rich in pigments, something I would not have expected, according to the latest research. I do not know neither the author nor the violin, does anyone know if its conditions are good (original varnish?) and so if the images are reliable? This gentleman seems to have many personal theories, does anyone know him? Cooking Varnish in a Melting Pot? Did anyone here on MN ever make a test with varnish application? Here is what I am trying to find out: if we are using turpentine soluble varnish we can apply it in let's say 3 thick layers with a brush or in 100 ultra thin layers with a cloth. Is there any difference in the visual result? Has anyone tried it? Hello all. So I've been reading up on as much information as I can within reason about the use of nitric acid in the cooking of varnish to produce color. Of course, reading about it has made me aware of the potential problems in using varnish produced with nitric acid. Some people claim to have success and others have many complaints from color shifts to drying problems to cracking and all sorts of fun stuff. Putting all of this aside, I have three main questions, both highly related. Does anyone know what quality of nitric acid produces the production of the colorant? Is it the oxidizing quality or the strength of the acid itself? Could the unnatural oxidation be what interferes with the drying time? Also, has anyone tried to achieve similar results with the use of chemical products other than nitric acid? Hello, I have a few questions regarding the appearance of my violin. I have been told it is probably German-made from the first-half of the 20th century. Please bear with me as I have no experience of wood-working or varnishing... Is the light-dark pattern of the back due to age and wear (light areas are worn more than the dark ones), or is it due to the way the wood originally took the varnish? What are the dark spots due to? I read that they are due to dings that happen during the life of the violin. Is that were true, wouldn't the varnish be damaged at each of these spots? It seems that the varnish is as smooth as everywhere else at these spots. Does the darkness of the back seem mean that it has been repaired? Thank you. This picture shows Joe's balsam ground preparation 3 after 3:1 dilution with turpentine. After a while the balsam seems to precipitate out. Has anyone encountered this problem? How these varnish lines can be removed? JOHA oil varnish from International Violin Co. So I got a few different colors of the JOHA oil varnish from IVC... I am quite pleased with it save for two points: 1 - it isn't dark enough. I've remedied this by adding color extract, so this is no big deal. 2 - it dries too fast... that may sound like an oxymoron, but I assure you it isn't. I did a little digging and found an old thread from 2008 that raised the same concern. I just tried one of the suggestions which was to thin the varnish with turpentine. That helped some; but it still dries too fast to be able to move it around to the point I am satisfied with it. I wound up with a belly and back that are 75% nice and 25% streaky/blotchy. Luckily I am doing this on some cheap white violins bought for varnish testing purposes, so it's not a total disaster. My question is: are any of you all using this/ experiencing the same issue? If so, have you cracked the code on how to alter it so that it remains workable long enough to varnish without being in a hurry, but retains some of the "quick" drying characteristics that make it nice from the oil varnish standpoint? I'd love to hear your recs on the issue if so. Ive been wood working for years, and finishing has always been a thorn in my side. I hate it... every aspect of it. That's why I'm looking for the closest thing that is "out of the box" ready for a decent finish on my first few fiddles. I have two done, and am getting close to a third... I'd like to make them look OK as far as varnish goes, but I'm not quite ready to dig in full time to perfecting a unique technique... I'm still learning the making process. Thanks for for all of your help! I was doing a routine inspection of my violin today and got to wondering about something... hoping someome more knowledgeable can clear up my curiosity... My violin has these black marks all around the top edge of the ribs where the top plate is glued on. But not anywhere else. Is this discolored glue residue? Varnish? Lead? Just was looking closer at things and was wondering what those marks were from in my violin's past. Here is a photo Thanks for clearing up my curiosity! I recently tested polyurethane (Minwax Wipe On Poly in gloss) by applying 3 generous coats to a sheet of Saran Wrap. After the third coat had dried thoroughly I wrapped the Saran around a soda straw. There was no flaking or cracking and the finish seemed to hold up quite nicely. Its a bit "outside the box" but does anyone have experience using it on a violin? Seems like a no brainer but I've never heard of it being used as such. What am I not considering about it? I have finished cleaning and setting up and adjusting an old probably German/Bohemian violin (the one I asked help identifying in this other post), and now I'm debating moving to a more hairy task with it: Varnish restoration! The violin has some scuffs and dings, but two that concern me are the ones on the lower bout bass side where a piece of it is actually chipped off, and on the back where some very aggressive shoulder-rest use seems to have worn through the varnish (please see pictures). The value of the violin is inconsequential, this is a work of love and for the sake of the experience, so I'm not worried if I mess it up, although I do have professional experience with restoration/conservation of vintage and ancient jewelry and swords (not exactly related, are they? ), so I am familiar with the delicate touch required, and the rule that less is more. What I'm wondering and hope you folks can help with is: First of all, are those spots issues that should be addressed, or would they normally be left alone unless a very pedantic customer insisted on them being restored? I have heard that bare wood is a bad thing and should be touched-up, but one shouldn't be neurotic to the point of touching up every little ding, but those spots are quite big in my opinion. What would be the most common way of restoring a chipped spot like that? Just varnish it over, or make a patch and glue it in place and the whole nine yards from there? Is there some relatively easy way to test varnish, to figure out if it's oil or spirits (shouldn't be anything else in this case I think)? Was there any relatively standard varnish preferred in the Schönbach area around 1900 (assuming it's from there) or are they all over the place? If there's no way to know what varnish it is, what would be the safest bet to go with for repairs? Oil? Spirits? Shellac? Something else? Are they relatively compatible or are they like paints where you don't put certain types over others? Thank you for your input! Who is planning on attending this workshop in Fredricksburg, VA? Joe Thrift is the instructor. Details are here. Varnish wear from neck contact/makeup? Hello MN - I am hoping you can help me with something. On the violin I have played for the past 15 years, there is a patch of worn varnish under the chinrest. This is located to the left of the end button and to the side of the chinrest brackets. It looks like a patch of varnish with a thick crackle with the veins of the crackle looking gray. I figured it was just wear from sweat and neck chub, haha. That was a student level violin with a thick, chippy, and red varnish to it. I recently got a new to me violin and after only playing it a few times already noticed wear in the same spot. Only on this instrument it appears as a patch of fuzzy/textured varnish that feels tacky to the touch. The leftmost chinrest bracket also is no longer shiny but matte black. It's a vintage instrument. I tried to capture it in photos but had trouble. 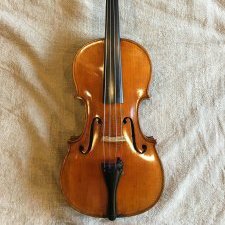 I am still in the stages of really babying my new violin baby, and I personally feel that authentic wear on instruments is really interesting and adds to their story. BUT with that being said I do not want to damage the integrity of my violin, depreciate it's value, ruin that patch of varnish and wood any further, or create a costly repair. I'm probably overacting but I live by the "dose of prevention" motto. Is this something I should be super concerned about? Is there a way for me to clean that patch of varnish to smooth it out and harden it up again? Is there something in my perfume, makeup, lotions that could be causing this reaction with the varnish??? I'd like to know so I can be aware of that product and wash it off if need be Maybe it's just something with my skin... I've noticed that plated jewelry seems to change color quickly for me and I have really oily skin in general. I don't want to cover the chinrest and back with a cloth because it makes rhe violin feel too precarious. Any products I should look into to protect that part of the instrument? Thanks in advance for your help! I am currently repairing an old German violin. I've just finished a bit of touch up work and to my disappointment the new varnish is much more glossy than the original varnish. I used spirit varnish for the touch up work. Despite intially rubbing away the gloss with 0000 steel wool, it returns after a few moments of being left alone. Ive seen a few places recommend silica gel. If that is a solution how much should be mixed with the varnish? Thanks! Typically I am asked by customers to smooth anyway textured areas in varnish. I do this by wet sanding with 1500 micro mesh, then moving to 2400 mirco mesh, before finishing with 0000 steel wool. The result is effective as the textured area is now smooth. My concern however is that the micro mesh and steel wool leave small micro scratches in the varnish. They are very small and thin grey lines. Is there a way to avoid these scratches in the future? Thanks! There are so many threads about antiquing that it is likely someone already has answered this question. But finding that answer would be like finding a sable brush hair on the back of a cat. Some of what we see on older instruments and newer antiqued ones is the accumulation of varnish, polish, body oil, and/or schmutz. My question is whether these accumulations can be replicated on a new instrument without full-blown antiquing. Example: Rasp marks -- or what appear to be rasp marks -- are visible on the edges of the da Salo tenor viola at the NMM. It doesn't hurt that da Salo's edges are relatively flat so the marks are not obscured by the edge curves we see on Cremonese instruments. Much of the varnish color has been worn off the edge which also helps the darker rasp marks stand out. I am considering using more of golden brown varnish on a da Salo viola, but still would like to gently enhance the visibility of the tool marks -- ideally without the highlighting that probably come with antiquing. [NOTE: This is not an antiquing v. fresh varnish thread, so let's not go there. Again.] Any strategies out there?